Objective: Osteotomy is an essential procedure in the operation of bone transport. In recent years, multiple drill holes and transverse osteotomy gradually becomes the foremost method for osteotomy, being favoured and recommended by many clinicians. Methods: 60 femoral moulds which were covered with bubble were used to simulate human femurs, and were divided into 3 groups: non-guiding group, simple drill guiding group and drill-osteotome guiding group. After the osteotomy finished, the time cost, the match rate between drill holes and osteotome tracks, the maximum vertical distances between drill holes as well as of osteotome tracks of the incision sides and the contralateral sides were recorded. Results: The data of three groups were analysed using One-Way ANOVA. With the use of the guidance, the time cost for osteotomy can be obviously shortened, the difficulty of osteotome cutting and the harm to surrounding tissues can be reduced. Conclusion: The difficulty of osteotome cutting and the harm to surrounding tissues can be reduced with the use of the guidance, obviously shortening the time cost for osteotomy. The guidance deserved clinical promotion. Although corticotomy was the best method for distraction osteogenesis, it was difficult be operated clinically. Whereas multiple drill holes and transverse osteotomy was easy to operate, with much better distraction osteogenesis than oscillating saw osteotomy [1,2]. After years of practice, multiple drill holes and transverse osteotomy is recommended and has now become the main method for osteotomy [3,4]. When operating with this method, each drill holes should be parallel. At the same time, the osteotome needs to go through the plane of the drill holes [5,6]. To meet these requirements, unarmed drilling and osteotome osteotomy is obviously very difficult. During the drilling, the guidance offer by the device can make the drill holes parallel with equal intervals. Yet, such guidance is not capable of guiding osteotome, which indicates that its effect is limited. 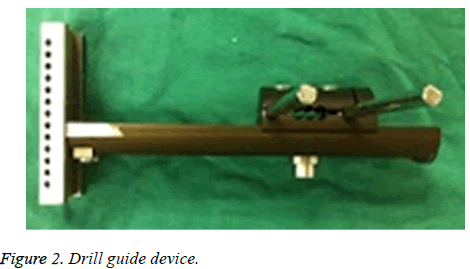 In our study, a guide device which can both guide drill and osteotome was designed. The device was operated in our experiment to investigate its function and effectiveness for osteotomy. The osteotomy guide device composes of 3 parts: holder with a chute, drilling guide device and osteotome guide device (Figure 1). There is a pin clamp in the holder, and the fixation of the osteotomy guide device is done through the connection between the pin clamp and the external fixation pins. Through the movement on the chute, the right position for osteotomy can be determined. The diameter of guide holes in the drilling guide device is 3.2 mm. Both the drilling and osteotome guide devices are connected to the holder through a dovetail, and the latter guide osteotome through a 2 mm-wide crack. During osteotomy, the osteotomy guide device is connected to external fixation pins and determines the correct position through the movement of the chute. At first, the drill guide device will guide the drilling (Figure 2). After that, osteotome guide device is in use to guide osteotome to finish the osteotomy procedure (Figure 3). Figure 1: Osteotomy guide devices structure. Figure 2: Drill guide device. Figure 3: Osteotome guide device. 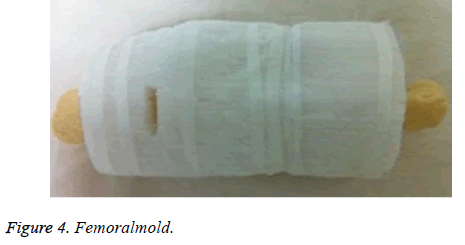 60 femoral moulds which were covered with bubble were used to simulate human femurs, and a crack with a length of 3 cm as well as a width of 2 cm was produced in the bubble (femoral moulds lateral sides, and 10 cm from lateral supracondylar) to imitate the operating incision (Figure 4). These femoral moulds were then divided into 3 groups: non-guiding group, simple drill guiding group and drill-osteotome guiding group, each of which were assigned with 20 cases (as for the drill guiding group and drill-osteotome guiding group, 2 pins were needed to fix into the middle of the femoral moulds, perpendicularly to the longitudinal axis of the femur, which were to simulate the external fixation pins for bone transport and limb lengthening). The drill diameter was 3.2 mm and 4 holes were drilled before osteotome cutting. The osteotome was 20 mm in width and 2 mm in thickness. In addition, the use of osteotome was not given a limit of time as for till when it should finish the osteotomy. All the experimental operations in this paper were conducted by an associated orthopaedist who had been engaged in orthopaedics for 13 y. For the non-guiding group, neither drilling nor osteotome cutting were operated with any guidance (Figure 5). Whereas only the former procedure of the both steps were operated with guidance in the simple drill guiding group as well as drill-osteotome guiding group respectively (Figure 6). Figure 5: Osteotomy operation of non-guiding group. 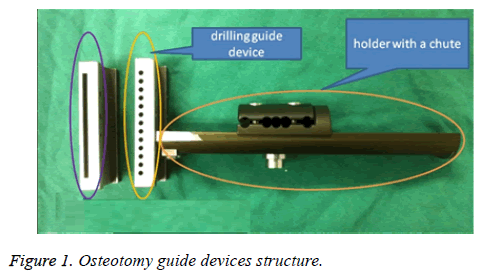 Figure 6: Osteotomy operation of drill-osteotome guiding group. After the osteotomy finished, the time cost, along with the match rate between drill holes and osteotome tracks, which observed from the osteotomy section plane, were recorded in each group (The drill holes and the osteotome tracks were only regarded as match when both of them were overlapping in the osteotomy section plane. The calculation of the match rate for each group was the number of match cases divided by the number of total cases (each group were 20) and then multiplied by 100%). Afterwards, the truncated femoral molds were redocked, observing the maximum vertical distances between drill holes as well as of osteotome tracks of the incision sides and the contralateral sides (Figures 7 and 8). Figure 7: Observation of maximum vertical distance between the drill holes in one side. Figure 8: Observation of maximum vertical distance of osteotome tracks in one side. Experimental data of each group were described as, x̄ ± s and analyzed by one-way ANOVA from SPSS19 statistical software, with a significance level of 0.05. Non-guiding group: The time cost of osteotomy was 10.07 ± 2.54 min. The maximum vertical distance between the drill holes of the incision side was 2.06 ± 0.40 mm, and of the contralateral side was 10.91 ± 2.04 mm. The maximum vertical distance of osteotome tracks of incision side was 4.26 ± 0.74 mm, and of the contralateral side was 12.87 ± 3.56 mm. The match rate between drill holes and osteotome tracks was 55%. Simple drill guiding group: The time cost of osteotomy was 6.20 ± 1.25 min. The maximum vertical distance between the drill holes of the incision side was 0.0 ± 0.0 mm, and of the contralateral side was 0.0 ± 0.0 mm. The maximum vertical distance of osteotome tracks of incision side was 3.39 ± 0.79 mm, and of the contralateral side was 4.8 ± 1.02 mm. The match rate between drill holes and osteotome tracks was 80%. Drill-osteotome guiding group: the time cost of osteotome was 5.56 ± 0.78 min. The maximum vertical distance between the drill holes of the incision side was 0.0 ± 0.0 mm and of the contralateral side was 0.0 ± 0.0 mm. The maximum vertical distance of osteotome tracks of incision side was 2.13 ± 0.38 mm, and of the contralateral side was 1.85 ± 0.33 mm. The match rate between drill holes and osteotome tracks was 100%. The data of three groups (the time cost of osteotomy, the maximum vertical distance between the drill holes, and the maximum vertical distance of osteotome tracks) were analysed using One-Way ANOVA. The test result are shown in the below tables (Tables 1-5). *vs. Non-guiding group, P<0.001; Drill-osteotome guiding group vs. simple drill guiding group, P=0.175. Table 1. Test result of the time cost of osteotomy. Table 2. Test result of the maximum vertical distance between the drill holes of the incision side. Table 3. Test result of the maximum vertical distance between the drill holes of the contralateral side. *vs. non-guiding group, P>0.05; #vs. simple drill guiding group, P<0.05. Table 4. Test result of the maximum vertical distance of the osteotome tracks of the incision side. *vs. non-guiding group, P<0.001; #vs. simple drill guiding group, P<0.001. Table 5. Test result of the maximum vertical distance of the osteotome tracks of the contralateral side. With years of clinical practice, currently, multiple drill holes and transverse osteotomy gradually becomes the foremost method for osteotomy [7,8]. More and more doctors have chosen Ilizarov technique as their treatment for chronic osteomyelitis and infected non-union patients, which has expanded the applications of Ilizarov technique as well as increased the need of osteotomy [9,10]. When operating with multiple drill holes and transverse osteotomy, the ideal solution is to make the drill holes parallel and the osteotome tracks overlap with the drill holes . Apparently, such procedure is hardly possible to achieve without guidance . In our study, we designed this guide device, which can both guide drill and osteotome. Through the pin clamp, the guide device can be connected to external fixation pins. The guide holes in the drill guide device and the crack in the osteotome guide device are parallel with the pins. The external fixation pins are screwed vertically into the long bones, to which the osteotomy surface by the guiding of this device is also therefore fixed vertically. According to the comparison of the time cost of osteotomy, the drill-osteotome guiding group is minimum, next is the simple drill guiding group, and the last one is the non-guiding group. This result could be easily derived through the osteotomy operation. With the absence of guidance, in order to make the osteotomy surface vertically to the long bones, a huge amount of time was wasted in the confirmation of the entry location and direction for the drill and osteotome. Additionally, without guidance, it was difficult to make each drilling holes parallel and the osteotome tracks overlap with the drill holes. This also contributed to the result that the match rate between drill holes and osteotome tracks of the non-guiding group was lowest among the three groups, yielding only 55%. As for the simple drill guiding group, its match rate between drill holes and osteotome tracks was much higher thanks to the drill guiding device, which made the drill holes parallel. As the osteotome commenced cutting bones, according to the principle of least resistance, the osteotome was prone to overlapping the drill holes, significantly increasing the match rate. As for the drillosteotome guiding group, because its drilling and osteotome cutting were carried out under guidance, of course, its match rate was 100%. When the match rate was higher, the operation of osteotomy was easier, and the time cost was shorter. Based on the experiment result, the maximum vertical distance between the drill holes and of the osteotome tracks of the nonguiding group were the longest among the three groups. At the meantime, significant difference was found between the incision side and the contralateral side in regards of such distances (the maximum vertical distance between the drill holes, incision side: 2.06 ± 0.40 mm, contralateral side: 10.91 ± 2.04 mm. The maximum vertical distance of osteotome tracks, incision side: 4.26 ± 0.74 mm, contralateral side: 12.87 ± 3.56 mm). The cause of this phenomenon was that the operation of osteotomy in the incision side was under direct vision, which could avoid obviously deviation during drilling and osteotome cutting. Nonetheless, the contralateral side was different. Although no obvious deviation was found on the entry position of the drill and the osteotome in the incision side, their directions were different. As they travelled to the contralateral side, they caused obvious deviation. When operating under the guidance, the entry positions as well as the directions of the drill and osteotome were the same, and hence the deviation mentioned above could be avoided (drillosteotome guiding group, the maximum vertical distance between the drill holes, incision side: 0.00 ± 0.00 mm, contralateral side: 0.00 ± 0.00 mm. The maximum vertical distance of the osteotome tracks, incision side: 2.13 ± 0.38 mm, contralateral side: 1.85 ± 0.33 mm, the difference of the maximum vertical distance of the osteotome tracks between incision side and contralateral side was because the osteotome was cuneiform, its edge portion was much thinner than its body, when it cutting bones, it led bigger gaps in the incision side than the contralateral side). According the pairwise comparisons of the maximum vertical distance of osteotome tracks on the contralateral side among the three groups, the P values were all less than 0.05, and the differences between the groups were statistically significant, indicating that osteotomy with guidance can narrow the deviation of the drill holes and the osteotome tracks. As a result, the harm to the periosteum and soft tissues can be reduced with remarkable significance. Additionally, when observing the osteotomy surfaces of the non-guiding group, we could find at least one or two drill holes that did not overlap with the osteotome tracks. These drill holes which had deviated from the osteotome tracks could not reduce the difficulty of osteotome cutting bones, but would conversely increase the harm to the soft tissues and the time cost of osteotomy. According to the experiment, we believe that the guidance has important significance in the application of the osteotomy. Such guidance can significantly narrow the deviation of drill holes and osteotome tracks, making the latter overlap with drill holes. Therefore, the difficulty of osteotome cutting and the harm to surrounding tissues can be reduced with the use of the guidance, obviously shortening the time cost for osteotomy. Hence, the guidance deserved clinical promotion. Because the scope of this research is small, the conclusion will inevitably be biased. This is also the limitation of this study. Therefore, this study needs to further expand the sample size to further clarify the results of the study. Kocabiyik A, Misir A, Kizkapan TB. Changes in hip, knee, and ankle coronal alignments after total hip arthroplasty with transverse femoral shortening osteotomy for unilateral Crowe type IV developmental dysplasia of the hip. J Arthroplasty 2017; 17: 30483-30487. Ishimatsu T, Naito M, Kinoshita K. Three-dimensional computed tomography analysis on bony birth canal after bilateral periacetabular osteotomy. J Orthop Sci 2017; 22: 531-535. Frierson M, Ibrahim K, Boles M. Distraction osteogenesis. A comparison of corticotomy techniques. Clin Orthop Relat Res 1994; 301: 19-24. Imholz B, Richter M, Dojcinovic I. Non-union of the maxilla: a rare complication after Le Fort I osteotomy. Rev Stomatol Chir Maxillofac 2010; 111: 270-275. Virkus WV, Goldberg SH, Lorenz EP. A comparison of compressive force generation by plating and intramedullary nailing techniques in a transverse diaphyseal humerus fracture model. J Trauma 2008; 65: 103-108. Bai S, Bo B, Bi Y. CAD/CAM surface templates as an alternative to the intermediate wafer in orthognathic surgery. Oral Surg Oral Med Oral Pathol Oral Radiol Endod 2010; 110: 1-7. Fink B, Grossmann A. Modified transfemoral approach to revision arthroplasty with uncemented modular revision stems. Oper Orthop Traumatol 2007; 19: 32-55. Möhlhenrich SC, Modabber A, Kniha K. Simulation of three surgical techniques combined with two different bone-borne forces for surgically assisted rapid palatal expansion of the maxillofacial complex: a finite element analysis. Int J Oral Maxillofac Surg 2017; 17: 31477. Chou PH, Lin HH, Su YP. Staged protocol for the treatment of chronic femoral shaft osteomyelitis with Ilizarov’s technique followed by the use of intramedullary locked nail. J Chin Med Assoc 2017; 80: 376-382. Zhang S, Wang H, Zhao J. Treatment of post-traumatic chronic osteomyelitis of lower limbs by bone transport technique using mono-lateral external fixator: Follow-up study of 18 cases. J Orthop Sci 2016; 21: 493-499. El-Rosasy MA. Ilizarov treatment for pseudarthrosis of the tibia due to haematogenous osteomyelitis. J Pediatr Orthop B 2013; 22: 200-206. Lin CC, Chen CM, Chiu FY. Staged protocol for the treatment of chronic tibial shaft osteomyelitis with Ilizarov’s technique followed by the application of intramedullary locked nail. Orthopedics 2012; 35: 1769-1774.